In the late August of 1966 Susan Atkins and two young men embarked upon a road trip that led them from San Francisco to Stayton, Oregon a small town east of Salem, Oregon. This would prove to be her first foray into serious crime. 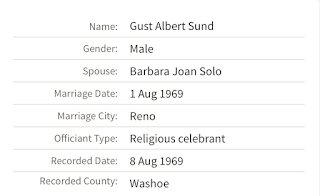 In her first book, Child of Satan, Child of God,Atkins refers to her two partners as “Al” and “Cliff” but contemporary records identify the two as Gust Albert Sund Jr., age 24 and Clinton Talioferro also age 24. Atkins was 18 years old at the time. Atkins describes her initial meeting with Al and Cliff. “It was the night shift. The boss was upset about something, but at first I didn’t pay much attention. Then I understood what was bothering him. “If those guys don’t clear out of the back alley in five minutes, I’m calling the cops,” he said through clinched teeth. “What’s going on, Max?” I asked. “What are they doing?” I persisted. When Max wasn’t looking I opened the door to the alley and stuck my head out. There were four guys—men—just outside the door. “Hey, you guys,” I whispered as loudly as I dared. “You’d better get going. My boss is going to call the heat on you. Like most of her reporting this description is not entirely accurate. 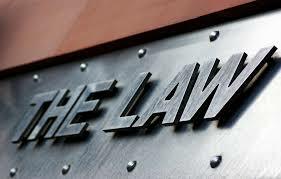 Atkins’ reporting of the events surrounding her first run in with the law is generally inaccurate and downplays her actual role in any criminal activity. She also omits from her narrative completely the only piece of this minor crime spree that would later come back to haunt her. The part that suggested her willingness or eagerness to kill. Looked at another way, Atkins’ report of her road trip is sort of a microcosm of her reporting in general: (1.) a charismatic male leads her astray (2.) she is present when crimes are committed but doesn’t directly participate (3.) it is filled with lies. Oh, and she even brags about her willingness to commit murder along the way, although this time to the wrong person. Wait, strike that last clause, it was the wrong person(s) later, too. In Lloyd Shearer’s The Manson Family Murders, Atkins is more accurately described as working, not at a coffee shop, but at a 24 hour burger joint. Since Shearer obtained his information from Atkins I guess she knew in 1970 (versus 1978) where she was working at the time. That restaurant is said to be Burke’s Restaurant at the corner of Market Street and 14thStreet in San Francisco. The actual name of the restaurant was Burke’s (Big Hamburger) Drive In. 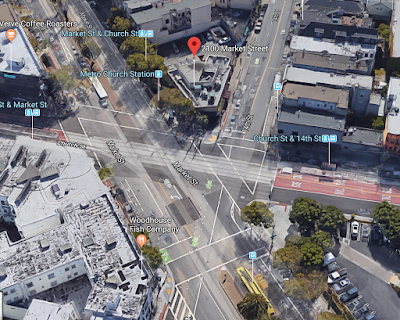 It was located at 2100 Market Street in San Francisco which was, indeed, at the three-way intersection of Market Street, 14thStreet and Church Streets. 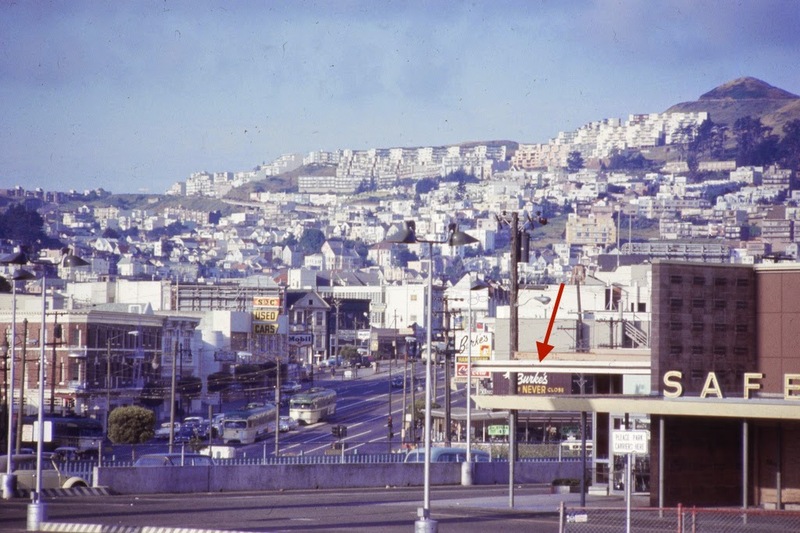 According to Polk’s Directory for San Francisco Burke’s opened in 1955. 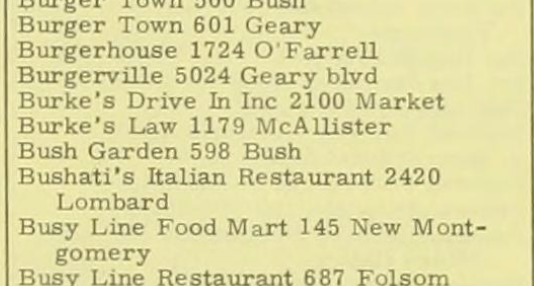 It is listed as Burke’s Truck Stop in 1975 and disappears from the directories in 1976. On August 24, 1966 Talioferro (and perhaps Sund) stole a 1966 Buick Riviera off the lot of Western States Leasing Company in Hayward, California. Interestingly, while Atkins in the Shearer piece, above, denies knowing the car was stolen she also acknowledges meeting Sund and Talioferro in “early August 1966”. I find it a little suspect that she would know about a planned road trip to Oregon and not know how they planned to get there. Atkins joined the two and they headed for Lake Tahoe, not Oregon. Atkins claims she went along on the road trip because she had fallen in love with Sund. “I changed clothes and away we went. At his place I was surprised to find six men living together in one large room. They seemed rough, but they were certainly polite enough to me, and they seemed to hold Al in especially high regard. They made me uneasy, but that all vanished as we roared off on his bike. My faith in him was so great that I believed him. In three or four days, we abandoned the Buick, guessing that an alarm for it was out by then. Using money stolen late at night from a gas station, we acquired what seemed to be the perfect car for us, a well worn, nondescript Rambler sedan, just right for young people doing some camping in the beautiful Oregon countryside. Equipment was easy to steal from the local stores, and we had everything we needed for camping in the woods near a river. Our chosen site was actually property owned by relatives of Clifton. 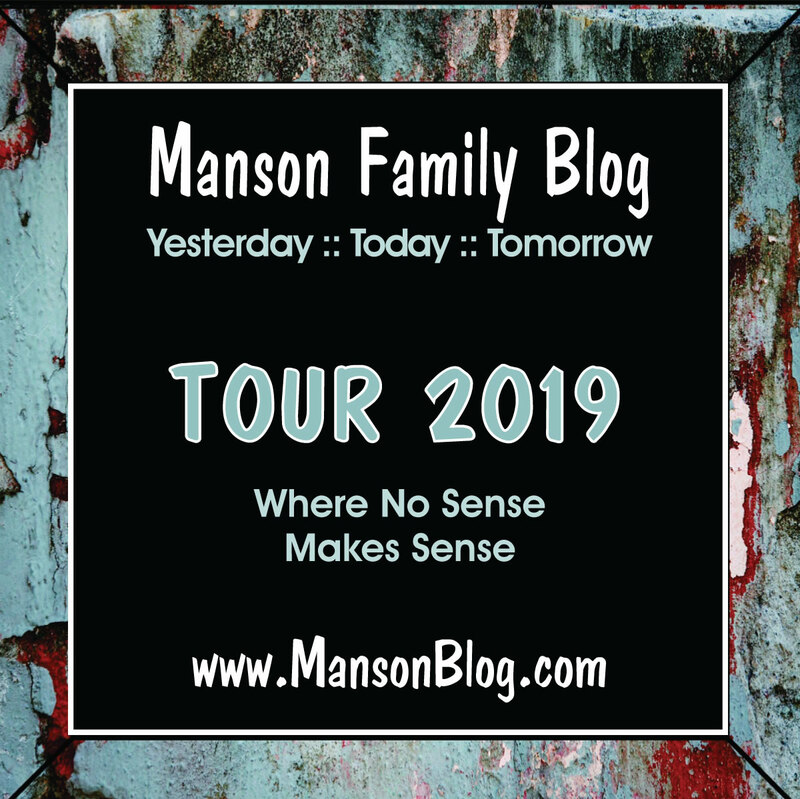 There is a similarity between her sudden intense feelings for Sund and decision to join that ex con after talking to him once and her first encounter with another ex con, Charles Manson. Both appear to have wooed her into blindly following them in a very short time. In Sund’s case, if Atkins is to believed, it was a matter of hours. Atkins claims that the original plan was to head for Lake Tahoe but somewhere along the way they decided instead to head to Oregon. When the trio reached Salem, Oregon they decided to ditch the Riviera. According to Atkins’ accounts they purchased a 1957 AMC Rambler for $65 as a replacement after burglarizing a gas station. 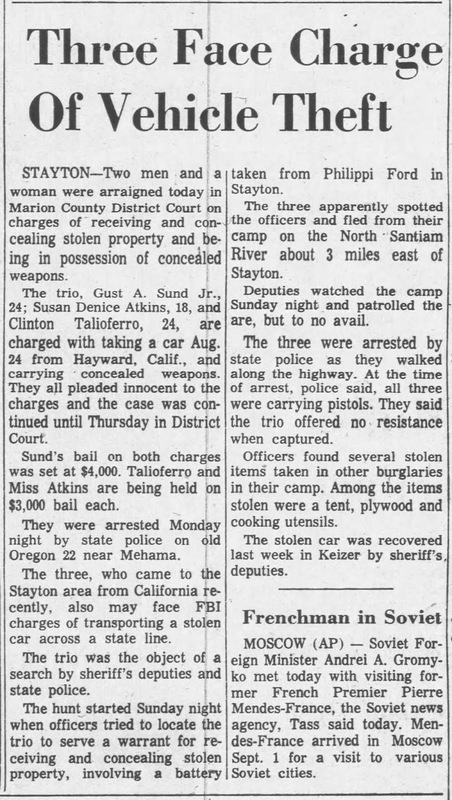 A newspaper article regarding their arrest says that the Buick was recovered by the police near Keizer, Oregon, which is just north of Salem. 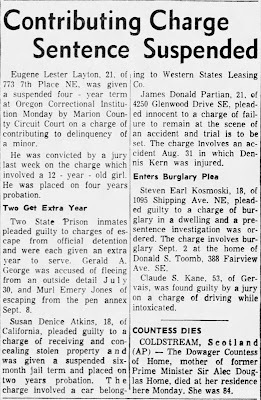 There may be some corroboration of Atkins in a small article about a burglary near Keizer shortly before their arrest. Atkins mentions robbing a gas station and this burglary is near where the Buick was ditched in Keizer. 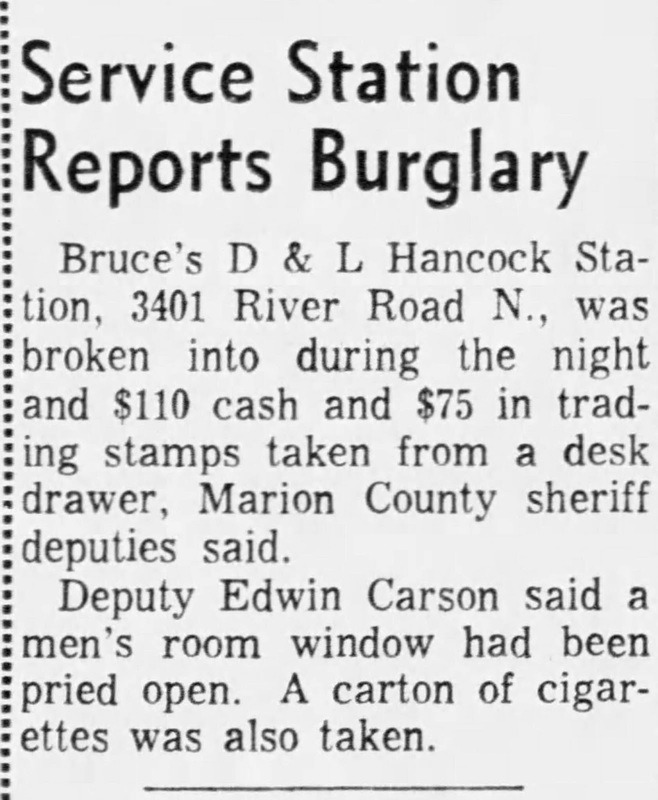 The burglars also netted enough cash, according to the story, to make the Rambler purchase plausible. For some reason, the three determined that their best course of action was to head east from Salem along state route 22. 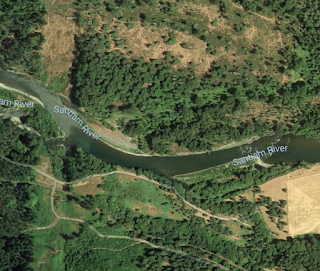 Somewhere a couple of miles east of Stayton, Oregon they camped along the Santiam River. The image, below is what the area looks like today. It probably was not vastly different in 1966. It was and is rural farmland backing to the edge of forest wilderness. Atkins claims they chose the location because they were camping on Talioferro’s cousin’s property. I was not able to locate a “Talioferro” anywhere in or around Stayton but then again there is no reason his cousin would share his last name. Atkins says they stole what they needed from local stores and private citizens. Newspaper accounts confirm her story at least to the point of confirming the camp consisted of stolen goods and several reported burglaries in the area. Around September 10, 1966 the battery of the Rambler gave out. In her book, Atkins claims that the plan was to hitch a ride with Talioferro’s cousin into town to buy a new battery. “Let’s go up to your cousin’s and see if he’ll drive us into town to get a new one,” replied Al calmly. “It’s worth a try,” said Cliff, “but don’t be surprised if he says no. I’m not his favorite cousin, you know.” Cliff smiled, evilly, I thought. We were camped more than half a mile from the cousin’s mobile home. As we approached it, we saw two Highway Patrol cars in the driveway. Atkins’ tale is inaccurate. Instead, the three stole a battery from Philippi Ford in Stayton. This event is what actually triggered the hunt for the three by the police. Apparently, a battery wasn’t the problem with the Rambler as they abandoned it somewhere in the vicinity and took off on foot. 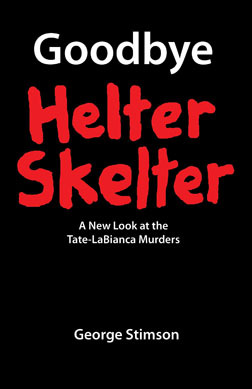 Atkins claimed to Shearer that the reason they were caught was because “Clinton told everybody about the stolen car, the guns and shot his mouth off.” This story also seems a bit problematic as it is difficult to imagine who Talioferro could have bragged to, being only the three of them around. It is possible that if the three were camping on Taliaferro’s cousin’s property that cousin may have been the one who heard the tale and it is also possible that he called the cops. Here is what happened. 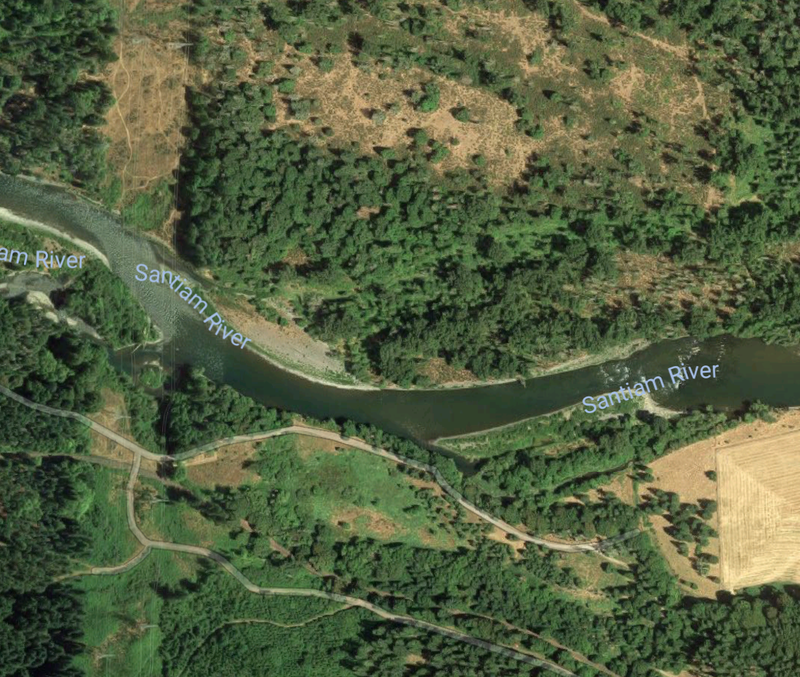 The police somehow got wind of the fact the three were camping near the Santiam River, possibly near at about the location in this image, below, which is the right distance from Stayton and reasonably accessible. As the police closed in on the place on the evening of September 11, 1966 one of the three saw the cops and they fled, leaving behind their stolen camping gear. The police staked out the campsite overnight but the trio didn't return and instead headed east, moving slowly in the dark. At about 7:05 p.m. on the evening of September 12, 1966 Corporal Thomas Drynan of the Oregon State Police accompanied by an unidentified civilian was returning from a week-long horseback patrol through the wilderness northeast of Stayton. As Drynan would later testify, in Oregon the function of ‘Game Warden’ is performed by the state police. 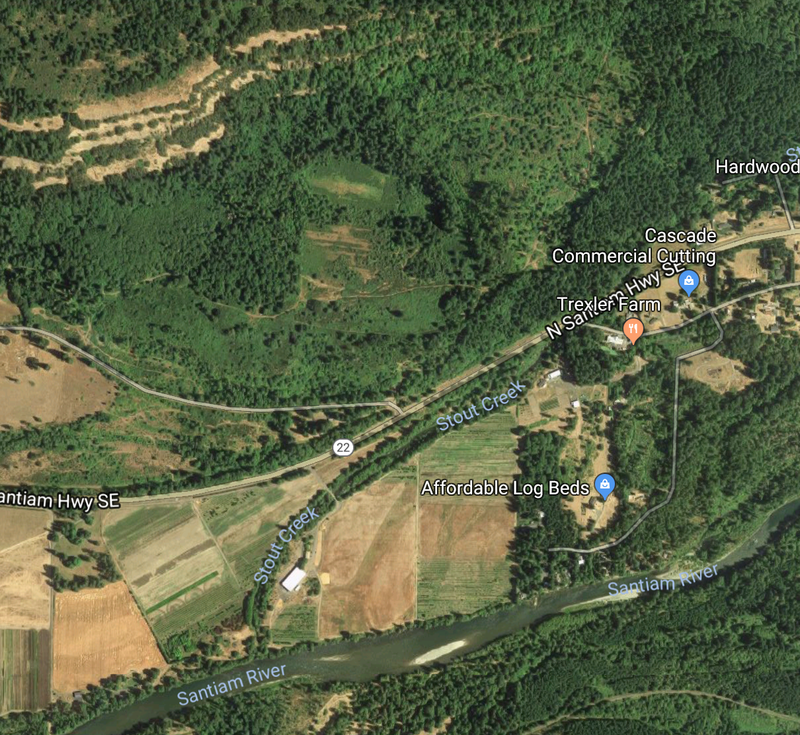 Drynan was out looking for poachers and, based on other newspaper articles from around the time where he is mentioned, he was also likely looking for individuals who would periodically steal small equipment and tools from logging camps in the region. He was heading back to Mill City where his office was located. Mill City is about 30 miles east of Salem, Oregon. Drynan was in civilian dress, wearing his badge and driving a four-wheel drive pick-up truck marked ‘Oregon State Police’ on both doors. He was hauling a horse trailer containing two horses. He turned onto Highway 22 from a gravel road at about the time he received a radio call about three suspects wanted on a warrant for receiving stolen property, who had earlier run from officers in the area: two men and a women. One man was wearing an Air Corps flight jacket. A few moments later he spied Atkins, Sund and Talioferro walking east on Highway 22 in the west bound lane, the same direction he was traveling. One of the men was wearing an Air Corps flight jacket. Drynan stopped and called the three over to his truck and asked for identification. Drynan’s testimony actually creates a geographic impossibility. He testified where the arrest occurred. 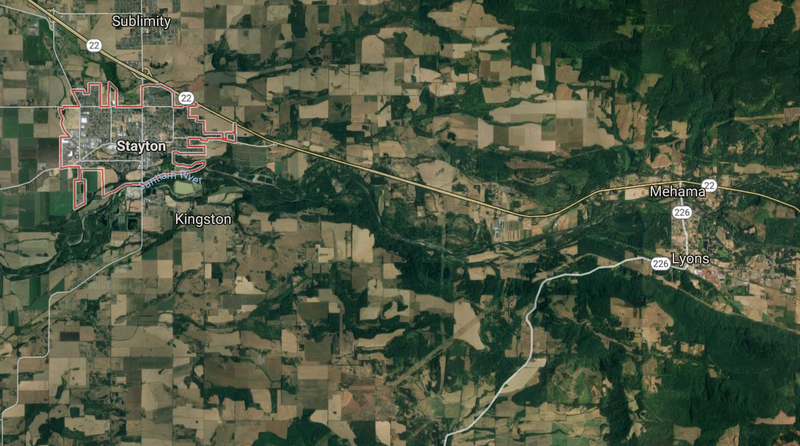 Stayton is about 17 miles east of Salem so he likely meant 20 miles east of Salem and two miles east of Stayton, which would place the arrest in this vicinity a couple of miles east of the possible campsite and close to Mehama, which is just out of the image to the right. Here is how Atkins described the arrest. “Ten or fifteen minutes passed. Then we heard a car coming. Cliff and I both looked at Al. He kept walking. It was a Highway Patrol van. The next thing I knew I was lying face down on the concrete highway, with a booted foot pressed into the small of my back. A shotgun was aimed at my head. “Don’t make one false move or you’re dead,” said a voice above me. We were searched head to foot, then handcuffed behind our backs. With my head resting on the pavement, I looked solemnly at Al. I could feel a tear running across my nose. Just three miles up the road, they had received a radio description of two men and a woman, armed and dangerous, wanted on suspicion of robbery and parole violation. Here is how Drynan described the arrest during his testimony. For chronological purposes I have placed Bugliosi’s direct examination after Shinn’s cross examination. A: I called them and asked them to come over to the vehicle. I wanted to talk to them. A: Well, after I talked to them and got identification from them, yes [I got out of the pick-up]. Q (Shinn): So, after you got the ID, what happened after that? A: I ran a check on them with my office by radio. Q: Yes, when did you get out of the vehicle? A: As soon as I received information from Salem that they were wanted. Q: When you say ‘they were wanted’ how did you know they were wanted? A: Because they were all three identified by name. Q: Did you draw your gun at that time? A: I made them lay down on the ground. Q: And then while you were arresting her she was quiet, was she not, scared and crying? Q: At any time while you were questioning Miss Atkins on the road you never—she never pulled that gun on you, did she? A: She had it pointed at me. A: She had her hands in her pockets and she had something pointed in my direction and that was the only thing in her pocket. Q: Did you at any time point your rifle at her neck? Q: How about your partner or your friend? A: He could very well have. Q: Were you there when he pointed the rifle at her head, made her cry? A: She did not cry at any point in time. Q: She was scared of you, was she not? Q: Did she look worried and scared? A: It did not appear to me that way, no. 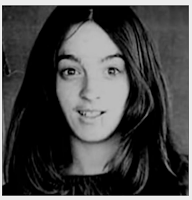 Q (Bugliosi): Did you search Susan Atkins? Q: Did you find any weapon on her person? Q: What type of weapon? A: A .25 caliber Germain-made automatic pistol. Q: Was the weapon loaded? A: It had six rounds with one in the chamber. Q: In route to Salem, Oregon, did Miss Atkins make any statement to you with respect to what she intended to do with that gun? A: I asked Miss Atkins what she intended to do with the gun and she told me that if she had the opportunity, she would have shot and killed me. Atkins leaves a couple of important details out of her version like the fact she had a loaded gun (with one in the chamber) and the fact she pointed the gun at Drynan inside her pocket and the, later, critical piece of evidence that she told Drynan after being read her rights that she would have shot and killed him if he had not acted first. Drynan’s description of the arrest does call into question Atkins’ stated intention. She had plenty of time while he was checking ID’s and talking on the radio to shoot Drynan if she had really thought about doing so. Her statement to Drynan is likely the same type of bragging that would get her into serious trouble in a couple years. Bugliosi used Drynan’s testimony in the penalty phase of the trial in an attempt to show the jury that Atkins had been eager to murder in cold blood back in 1966. Drynan had called Bugliosi in early December 1969 after someone in his office directed him to do so after Atkins’ name appeared in the press. Bugliosi later asked him to testify. I question how much of an impact Drynan’s testimony had. While the press made it a headline, given what the jury had already heard, this event is pretty tame by comparison. 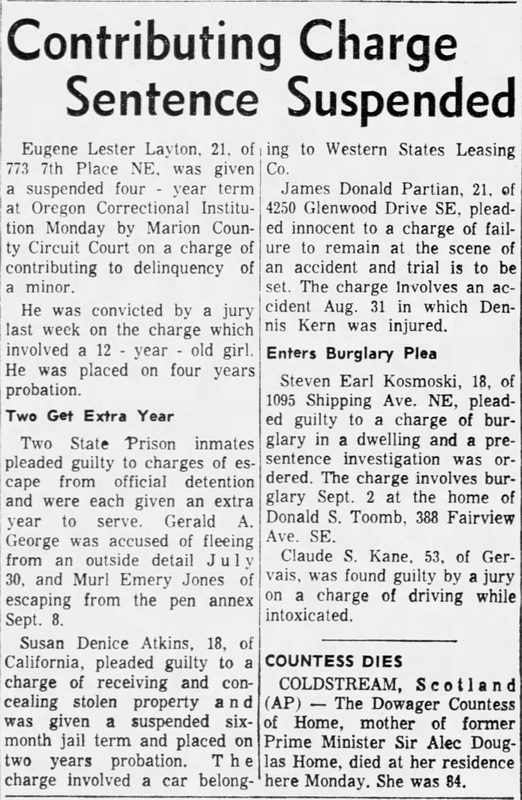 A few weeks later Atkins pleaded guilty to receiving and concealing stolen property. She received a six, month suspended sentence and two years’ probation. Albert Sund also pleaded guilty to receiving and concealing stolen property and also being an ex-convict in possession of a concealed weapon. He received two years in an Oregon penitentiary on each charge to be served concurrently. 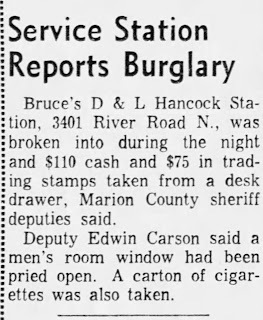 When he was released on January 31, 1968 after serving 16 months he was immediately arrested on charges stemming from a gas station robbery in 1966. 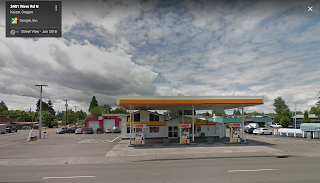 However, you will note that the charges relate to a hold up, one that occurred at the Freeway Shell Service Station north of Albany, Oregon. Albany is south of Salem. These charges were eventually dismissed by the DA because he could not locate a witness. 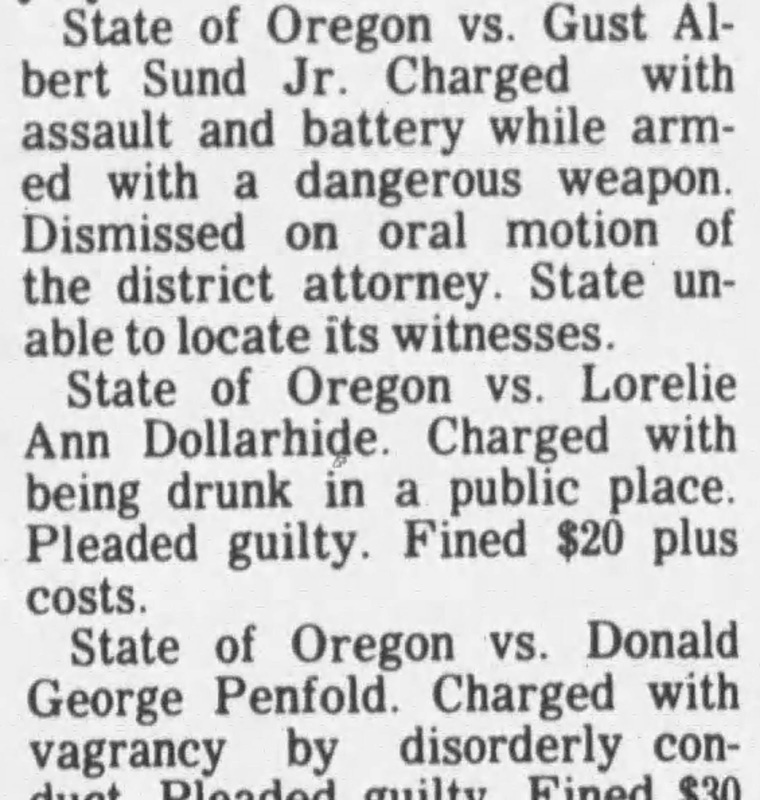 Given the description of the robber, the fact he was alone and the fact he had stolen a car in Portland and was thus heading south towards California (the wrong way), the DA probably had the wrong robbery and Sund actually avoided being wrongly convicted of that crime. Talioferro also pleaded guilty to receiving and concealing stolen property. He did not plead to the weapons charge, which is odd. He received a sentence of six months in the county jail but he was handed over to Federal authorities for transporting the stolen Buick across state lines. I was unable to find any record regarding the outcome of those charges. 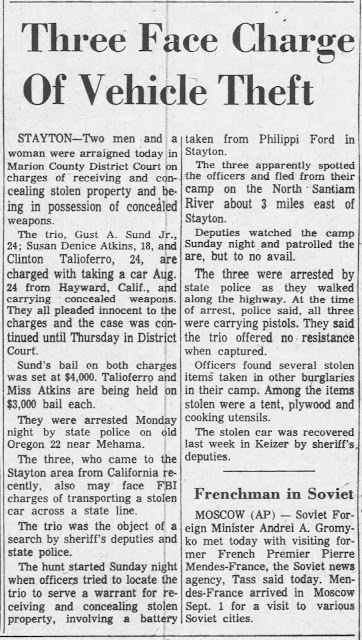 Some things have always baffled me about this case: how did the police/DA in Oregon know the three had stolen the abandoned Buick? How, as Drynan testified, did they police have their names before their arrest? And why wasn’t either Sund or Atkins pursued on the federal crime? Atkins’ parole hearings suggest she was charged but not prosecuted. It is possible, as Atkins claims, that Talioferro shot his mouth off to his ‘cousin’ who turned them all in. In fact, that almost seems to be the only answer to the first two questions. But that third question still baffles me. Why didn’t the feds go after all three? It is possible that Talioferro actually rented the car and didn’t return it. Atkins claims the two told her the car was rented. That would place Talioferro on the ‘stupid crook’ list, like the guy who wrote the demand note on the back of a personal check when robbing a bank. It is also possible both Atkins and Sund made a deal and threw the third musketeer under the bus. Corporal Drynan went on to have a long and successful career with the Oregon Highway Patrol. He was promoted to Sergeant in 1972, Lieutenant in the mid-seventies and Captain in 1984. He was instrumental in establishing an official ski patrol in the Santiam Pass region in Oregon in 1977. He retired sometime before 1989 when he makes his last appearance in the press, now as an advocate of logging. “Tom Drynan, a retired Oregon State Police officer*****held up pictures of people he said were local leaders of Earth First! A group which has been involved in tree sitting, blocking roads and other protests at logging sites. He urged those present to pick up the pictures of the Earth First! leaders on their way out and carry them in their pickups, then report their license numbers and activities if they see them in the woods. Clinton Talioferro disappears from history after his brief encounter with Atkins. At least I could find no record of him. 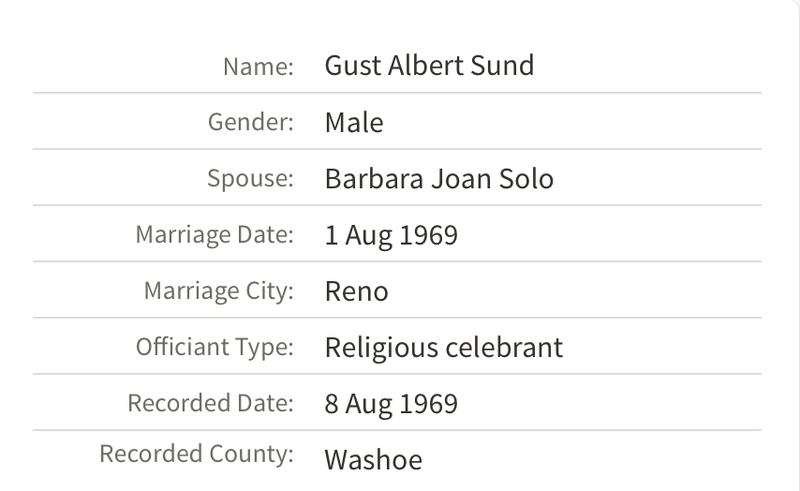 All I was able to locate regarding Gust Albert Sund, Jr. was two marriages, One in the mid seventies and this one, which is at least a little spooky. 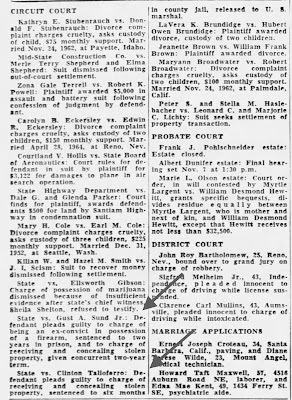 During the death penalty phase of the trial Atkins testified about her road trip. She testified that she went along with “Al” because she was in love with him and also acknowledges the gas station burglary. However, perhaps preparing for future parole hearings, she also claimed that Talioferro (whom she calls “Cliff”) threatened to kill her if she left the three at one point. Atkins also testified that the reason she had a gun was to defend herself from snakes. Atkins also discussed her road trip at her 1979 parole hearing. She, again reiterated that she had joined “Al” and “Cliff” because of her love for Al and also restated her claim that Talioferro had threatened to shoot her in the back if she tried to leave. To the best of my knowledge this is also the only time Atkins admitted threatening Drynan, stating that she said to the officer: “I should have killed you”. Relying on one of her classic excuses Atkins claimed she said it to show how tough she was. That may be true and helped her as much as the second time she tried being a 'tough guy'. She also claimed the gun was tucked into the waist of her shorts. This was likely to refute the fact she actually pointed the gun at Drynan in her coat pocket. 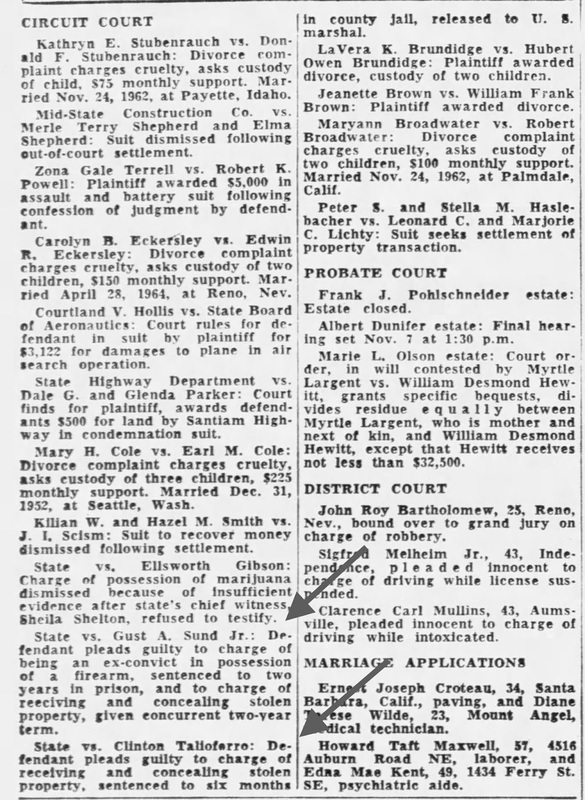 I have included a short article from the Albany Democratic-Herald from December 12, 1969, below. Notice how the facts of Atkins’ previous arrest were altered and are more in keeping with the whole ‘hippy cult’ concept. 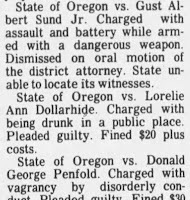 I find it ironic that one of the least credible witnesses to the events surrounding these crimes would have the story of her Oregon arrest reported using a series of inaccurate statements. The only thing they got right was the date of the arrest.